This impressive gift basket has a wide selection of fruits, snacks & sweets that is sure to make their day! This handsome walnut stained wicker & rope basket is tied with a moss green satin ribbon and filled with six types of fresh fruit, nuts, snacks, chocolate and other candies. They'll love you for sending this gift! 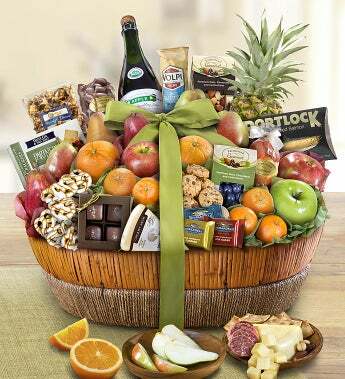 Make their day with this deluxe basket filled with premium quality gourmet foods, fruits, and sweets. This handsome walnut stained wicker basket is tied with a moss green satin ribbon and is filled with six types of fresh fruit, nuts, snacks, chocolate and much more. This gift really shows how much you care!